You can make this recipe with any fruit you have on hand–peach, blackberry, or apple are my favorite. What’s yours? Pour cleaned and prepared fruit into an 8 x 8 baking dish or 9-inch pie plate. Sprinkle with cinnamon and sugar. Stir together until mixed in the dish. Combine the topping ingredients (except the butter) in a bowl and stir with a fork until it forms a crumbly mixture. Sprinkle on top of the fruit and drizzle melted butter over top of the cobbler before baking. Bake for 30-45 minutes, depending on the size of the pan. 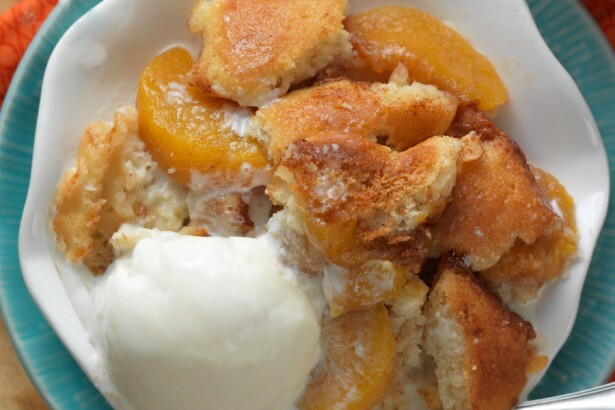 The fruit should be bubbly and the topping browning slightly. Serve warm, plain or with vanilla ice cream. I will definitely try this dessert.